Well, Gangfight Games has bad news and good news about their recent Kickstarter campaign for the Savage Beasts expansion for Blackwater Gulch. The bad news is that the campaign didn't fund (which is sad, as I really was hoping they'd make it to the bear stretch goal). However, the good news is that, during the campaign, their regular sales shot up and so they were able to afford creating the figures after all. They've added the various bundles that had been part of the Kickstarter over to their webshop. As for MechaDrome, they will be getting back into that at the start of the year. 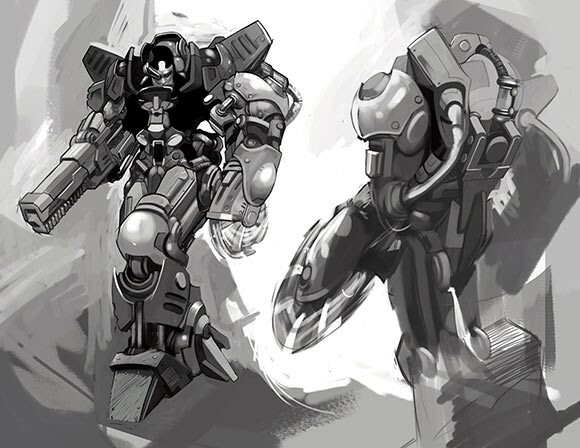 There will be a new format for the mechs.There will be new Terran Light Mechs (the current Light Mechs will become Medium Mechs, and Mediums will become Heavies). The newest figures will be about Terminator-size from 40k. You will also be able to take updated Drone models and figures for Pit Crews. More details will be forthcoming as the actual update time gets closer.